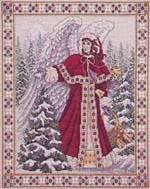 Model size: 13.875" x 11.375"
Description: A stately angel robed in a lavishly beaded deep red cloak strolls through a moonlit evergreen forest, scattering glittering frost upon the dark green boughs. An ornate beaded border finishes the scene. Background Information: I had always wanted to design a full-sized angel and to place him/her in a believable (earthly) setting. I also wanted to clothe this celestial being in something eye-catching so the wings wouldn't be so obvious. I don't often use the color red as I find it very difficult to "control" (it tends to overpower: to grab your attention immediately, and I also find I *must* blend reds, as the individual colors just seem too brash)...For this design, I needed red: the robe color needed to be strong to compositionally balance the wings, and to act as a foil for all the beading decoration I had in mind. The background trees are done with half stitches to give the impression of distance, whereas the face is stitched over-one to emphasize the detail. The heavily beaded border repeats the motifs found on the robe, and finishes the design. Stitching Comments: This is a fairly large piece with lots of blended floss colors, fractional stitches, and many, many beads. It also contains some over-one stitching (the face), blending filament, and some specialty stitches. I would have to rate this design as moderately difficult because of all of the above, but if you're looking for a full-size angel that has a Christmas-y flavor, you might want to give this design a try.